Front view of an autonomous test vehicle running on software enabled by PolySync's platform. PolySync aims to make autonomy system development feel more like mobile app development, freeing developers to focus on algorithms while spending less time on assembling the back end. Image courtesy of PolySync. It's hard to overstate the impact that self-driving cars are having on the automotive supply chain, which, these days, is morphing into what many are describing as "the new mobility ecosystem." Literally and figuratively, the development and manufacturing of self-driving cars–which hasn't even scratched the surface yet –is steering the supply chain in different directions, from metro Detroit to Silicon Valley to Pittsburgh and the Southeastern United States. The emergence of a new automotive ecosystem is changing the look of the Detroit metro area, where automakers and suppliers continue to invest heavily in R&D, reshaping what had been an old style manufacturing center into a new hub, or hotspot, of technical innovation. "There's a big emphasis in the metro Detroit area on trying to really grow and to train the technical talent," Daron Gifford, an automotive analyst at Plante Moran, told Design-2-Part Magazine in a phone interview. "There's a lot more encouraging of investment, and a lot more investment, actually, especially with suppliers, into R&D and engineering. This is kind of a hub for that." Not too long ago, Silicon Valley did not have anywhere near the same automotive presence that it has today. But automakers and suppliers view it as a prime location for high technology talent, especially for software knowledge and the capabilities needed for autonomous vehicle development and ride sharing. 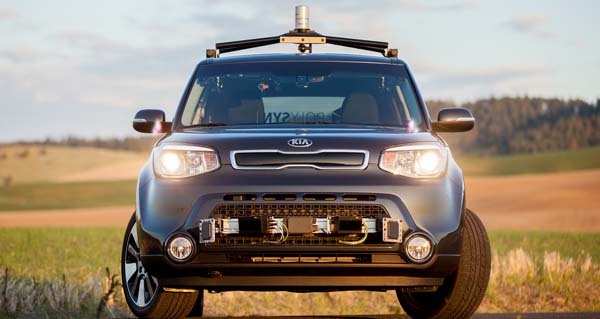 The Pittsburgh area, too, has emerged as a prominent hub for autonomous vehicle development, largely due to the robotics program at Carnegie Mellon. The winner of the Top Ten Automotive Startups Competition at November's LA Auto Show is PolySync, a Portland, Oregon startup that's building a platform for developers of autonomous vehicle software. Josh Hartung, CEO of PolySync, told Design-2-Part Magazine that he loves having his company headquartered in Portland. "I don't think it's for everybody," he said in a phone interview. "If you want to build high-end autonomous software using the latest in machine learning, you ought to be in Silicon Valley. And if you want to bend metal and build physical vehicles, I think you should be in Detroit. But here, we're building underlying software infrastructure, and we're able to pull from a really, really deep talent pool. The overall cost of doing business here is much lower for us, so we can scale up a bigger team. And we're able to easily get to both Detroit and Silicon Valley from here, so it's been a great location for us." Beyond its geographic impact, the development of autonomous vehicle technologies is sending ripple effects throughout the U.S. supply chain in a number of other ways. The high demand for specialized capabilities in software, electronics, and hardware-software systems integration has already spurred significant mergers and acquisitions activity and figures to promote further consolidation of the supplier base going forward. It's brought into clearer focus the training and skills–namely software engineering–needed to solve many of the daunting challenges that are unique to the industry. It's also highlighted the continuing need for collaboration and partnering between OEMs, suppliers, and contract manufacturers as they tackle problems that haven't been dealt with before. After all, the industry represents uncharted territory. One of the questions that many have asked is whether the emergence of self-driving cars and other autonomous vehicles will significantly impact the number of vehicles that will be manufactured in the future. Although the jury is still out, there's reason to believe that with the expected greater use of the vehicles by commercial fleets, production of autonomous vehicles will either hold steady or actually increase. "My belief is that as we get autonomous cars, overall vehicle utilizations will go up because they will be so much easier to use, and cheaper overall, than owning and operating your own car," said Hartung. "These cars will wear out more quickly because they're being utilized more often, and we'll have to build more cars." In the short term, over the next 10 to 20 years, we're likely to see mixed fleets of autonomous and traditional, non-autonomous vehicles. Ride sharing is likely to increase. "I think you'll see a segmentation of the types of products that are out there," said Hartung. "So automakers will need to figure out how to deal with that type of change. But overall, if they're able to deal with a higher-mix supply chain, then I think they're going to do very well because the volumes will generally increase."